In 2011, Ohioans passed the Healthcare Freedom Amendment by a nearly two to one margin. The amendment, in essence, states that Ohio does not want the healthcare mandate — the requirement to purchase insurance under ObamaCare. 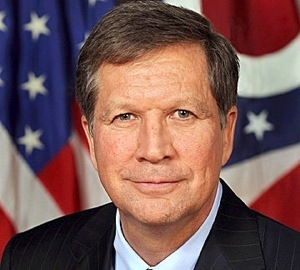 Today, Ohio Governor John Kasich signed a letter to the Centers for Medicare and Medicaid Services Center for Consumer Information and Insurance Oversight. This letter is to inform you of Ohio’s decisions regarding whether or not to implement the health benefits exchange mandated by the Affordable Care Act (ACA), and other issues. The law requires the Secretary of the U.S. Department of Health and Human Services (HHS) to certify states’ plans by January 1, 2013 and, in order for the Secretary to carry out this task, HHS is requiring states to submit an Exchange Blueprint. My administration is committed to improving health care for all Ohioans through forward-thinking, solutions-oriented strategies aligned with our state’s ongoing efforts to create a jobs-friendly climate. Accordingly, we are modernizing Ohio’s Medicaid program, streamlining outdated health and human service delivery systems, implementing insurance market reforms and changing how we pay for care to reward value and coordinated care rather than volume. We continue to make great strides in these endeavors despite significant headwinds expected from the law—higher health insurance costs, significant uncertainty in our insurance market and major new costs to states. Additionally, HHS is asking states to make final decisions on fiscally and economically significant and pivotal issues without promised federal guidance and rules for issues such as essential health benefits, market reforms, multi-state health insurance plans and more specifics regarding the federally-facilitated exchange. At this point, based on the information we have, states do not have any flexibility to build and manage exchanges in ways that respond to unique needs of their citizens or markets. Regardless of who runs the exchange, the end product is the same. • The Director of the Ohio Department of Insurance is designated to work with HHS to finalize the Exchange Blueprint and work through other related issues. Given that HHS has extended the deadline by which states must submit their blueprint applications, Ohio reserves the right to amend its intentions as stated in this letter, should HHS announce any changes or present states with new information, rules or interpretations of the law. I am confident Ohio will meet federal standards to maintain its control of these responsibilities. In the meantime I urge you to promptly issue the guidance and rules Ohio needs to align plan management and Medicaid eligibility with an otherwise federally-facilitated health benefits exchange. New report shows nearly 14k more jobs last month and unemployment at lowest point since '08. More work to do, but headed in right direction.